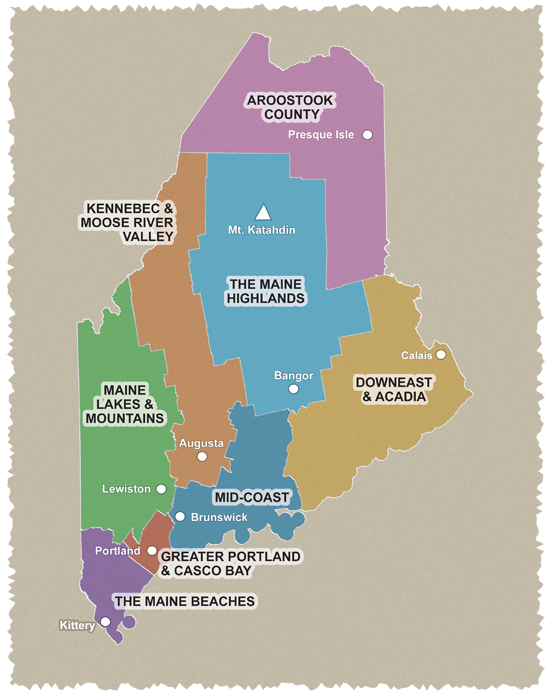 Connected to the mainland by a bridge, Mount Desert Island and Acadia National Park are the most frequently visited locations in Maine. Travelers can bike to their hearts content on miles of interconnected carriage roads - and hike one of 26 mountains. Plus, 22 lakes and ponds, beaches and natural wonders provide plenty of relaxation. This quiet highway is just a few miles from busy Route 1, but seems worlds away. Great gray owls and bald eagles soar overhead as visitors travel from Franklin to Cherryfield, which serve as gateways to this byway. Visitors will enjoy the sight of rich blueberry barrens on nearby hillsides. Cherryfield is known as the "Wild Blueberry Capital of the World." This route passes through the only mainland section of Acadia National Park and beautiful Schoodic Point. The cold North Atlantic waters of Downeast Maine are filled with lobster boats and the coast is lined with wooden piers, lighthouses and wildlife. Take in majestic views of Cadillac Mountain and Mount Desert Island along this drive. This area also is famous for rolling hills lush with wild blueberries.